Alstom, IGE+XAO and Safran agreed to create a Centre of Excellence in Toulouse for the engineering of onboard railway electrical systems. The international Centre of Excellence, located on the site of the aeronautical equipment manufacturer Safran Electrical & Power, will be able to accommodate up to 100 engineers. Using the packages of the software publisher IGE+XAO and relying on its technical support, the centre will develop the railway electrical systems of today, from design to standardisation and operational maintenance of the electrical products of Alstom’s transport solutions. Its activities will also focus on innovation by developing the systems of tomorrow. 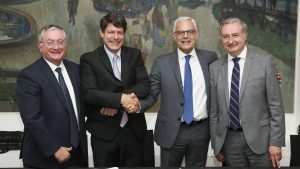 “With its new development methods, the Centre of Excellence will help to strengthen Alstom’s skills and responsiveness in the field of onboard electrical systems, by benefiting in a collaborative environment both from the best practices of the aeronautical sector, which is leading the way in this field, and the proximity of IGE+XAO’s teams, experts in the railway electrical industry. It will be one of Alstom’s assets in meeting the challenges of tomorrow’s mobility,” said Thierry Best, Alstom’s Director of Operations. Under the agreement, IGE+XAO is providing its expertise in terms of its software and associated services. IGE+XAO will provide its software suites dedicated to the lifecycle management of electrical systems, as well as a service offer ranging from software validation to user assistance, including training and management of the hardware platform. Alstom and IGE+XAO are partners since 2011 and they have achieved a significant milestone with the signature of a technical and commercial contract over a 5-year period. With Safran, Alstom signed an agreement focusing on electrical product design. Safran Electrical & Power is providing Alstom with a team of experts in the design and standardisation of electrical systems. The agreement follows a partnership between the two groups announced in 2017. This new stage in the collaboration between Alstom and Safran responds to an increasing need to share best practices between the worlds of aeronautics and rail.